Please note that A Christmas Story is NOT on this list. I don't know what it is about that movie, but I just can't bring myself to love it! 1. Love Actually. Why is this movie so great? I don't even know where to begin. It will make you laugh and make you cry. It stars both Hugh Grant and Colin Firth. It features an amazing little girl singing Mariah's All I Want for Christmas is You and a washed up old drunk singing the ridiculous Christmas is All Around. It's just a really well done holiday movie/romantic comedy that you can enjoy any time of year-- but especially at Christmastime. 2. White Christmas. Such a classic musical. This is a long movie, but I love every minute of it. It's where the song White Christmas originated, but it's that Count Your Blessings number that always makes me all weepy. I'm such a sap. 3. National Lampoon's Christmas Vacation. 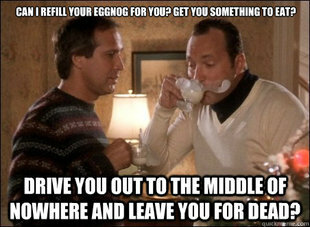 All the National Lampoon's Vacation movies are hysterical, but this one is chock full of excellent Christmas one liners. "Oh, the silent majesty of a winter's morn; the clean, cool chill of the holiday air; and an a**hole in his bathrobe, emptying a chemical toilet into my sewer." Priceless stuff. Every time I watch this one I laugh just as hard as the first time I watched it. 4. Home Alone. I remember seeing this one in the movie theater when it was first released. Who knew it would become a modern classic? It was definitely Macaulay Culkin's best work and an appearance by the late John Candy makes the movie. This is another one that you can frequently find Alex and me quoting throughout our everyday life. "You're what the French call les incompentents" and "Buzz, your girlfriend... Woof!" 5. A Charlie Brown Christmas. I remember watching this one on a staticky VHS tape after my mom recorded a showing on TV. We watched that tape over and over again and the soundtrack is one of the best. Christmastime is Here and all of those other jazzy tunes have become so iconic. And don't you just love when the Peanuts sing them with their noses up in the air? 6. It's a Wonderful Life. This is the ultimate Christmas movie. I don't know if there is much else to say about this one except that it's a beautiful story about love and the spirit of the season. And decades later, it still feels just as relevant. Now, that's a good movie. 7. The Family Stone. I first saw this one in an English-speaking movie theater in Florence when I was studying abroad. I went with a bunch of girlfriends and we all missed home, so there wasn't a dry eye by the end of this movie. It's a great movie about family that will make you laugh, cry, and cringe all at the same time-- just like spending Christmas with the family! 8. Elf. Everyone loves a good Will Ferrell movie, but Will Ferrell as a naive adult elf let loose in New York City searching for his long lost father (who happens to be on the naughty list) is like the perfect Christmas storm. Another movie full of great one liners i.e. "I'm sorry I ruined your lives, and crammed eleven cookies into the VCR" and some great music too. Will Ferrell and Zooey Deschanel singing Baby, It's Cold Outside is the cutest! 9. Rudolph the Red-Nosed Reindeer. This is another childhood favorite from our homemade VHS days. It's by far the best of those Christmas stop motion animated movies and although a little corny, I have to watch it every year. I just love those misfit toys and that goofy little effeminate elf with dreams of becoming a dentist. 10. Miracle on 34th Street. It's a toss up between the old one and the new one. I love the old one because its a classic, but the new one is so great because that was the first that I saw-- and Dylan McDermott was so 90's cute! Another great story about the spirit of Christmas and belief. And as a little bonus, here's a throwback for you. It's one of my favorite 80's Christmas commercials! This little gem was on that homemade VHS tape of Christmas TV specials that I referenced above, so long after they stopped running this old McDonald's commercial my siblings and I still saw it every Christmas when we broke out the Christmas movie tape. Enjoy!